An estimated 1.75 million blocks of land across Australia face bushfire risk, according to data released by the Insurance Council of Australia (ICA). Worse still there’s a danger that a high proportion of these properties may be underinsured – leaving landowners potentially facing dire financial consequences in the event of a loss. The warning comes as the Bushfire and Natural Hazards Cooperative Research Centre (BNHCRC) upgraded its seasonal bushfire outlook for the second time since spring. With large areas of eastern and southern Australia facing above average temperatures and below average rainfall, the threat of grassfire, in particular, is high after the wet winter led to ideal growing conditions in grassland areas, creating high fuel loads. As a result, regional emergency services are encouraging households to assess their bushfire exposure before it’s too late. Although southern and eastern areas of Australia are thought to be under the most immediate bushfire threat, the ICA figures indicate that no land owner in rural regions can afford to be unprepared. 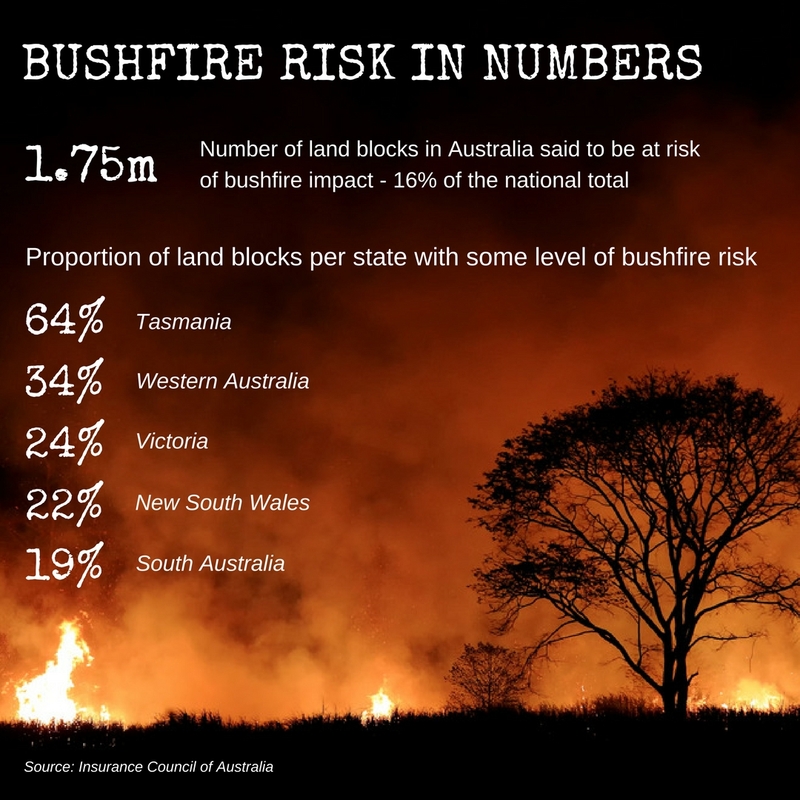 The ICA estimates that 64% of land blocks in Tasmania have some degree of bushfire exposure, compared to 34% in WA; 24% in Victoria; 22% in NSW; and 19% in South Australia. Although the bushfire threat in QLD is lower, there are still pockets of the state at above-average bushfire risk, most notably around Mount Isa and great swathes of inland and coastal areas from Noosa up to Rockhampton. Changes to national building standards in recent years have been introduced to make homes in bushfire-prone areas more resilient, but the resultant rebuilding costs can be substantially higher – and that’s something that every rural home owner should factor into their insurance cover, says Daniel Quintin, Branch Manager at Gallagher's Hobart office. “Householders that either aren’t aware of the new building standards, or who simply haven’t updated their insurance to cover these rebuilding costs, are at a great financial risk in the event of bushfire losses,” said Quintin. “Underinsurance occurs when your property is insured for a sum that’s too low to fully rebuild it, or to replace all its contents. It’s very common for properties to be underinsured, but the consequences can be disastrous. Homeowners are also encouraged to contact their local council for information about the bushfire zoning of their property.